Add deep rich colouring to your home or office with our premium bespoke red vertical blinds which feature a high quality mechanism, contemporary rounded aluminium headrail and fully sewn slats for a truly luxurious look and feel. 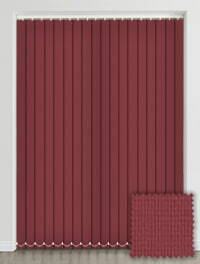 Regulate heat, light and privacy in the most stylish way with our stylish collection. They are both an elegant and practical way to control the glare from the sun whilst helping to creating a cosy and snug atmosphere in the room. Red is a fabulous colour if you want a rich, passionate and colourful look. It brings warmth and heat to a room’s décor and has been the colour of choice for many eating rooms and dining rooms as it is the colour that makes us feel hungriest apparently! 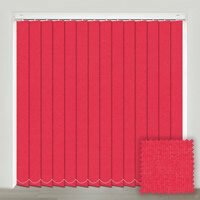 It is also associated with increased energy and excitement and is a sure fire way to attract attention, so if you want to bring a truly exciting and colourful look to the windows then some quality made to measure vertical blinds are the ideal choice. With a free fabric sample service and fast delivery these beautiful shades can be adorning the windows of your home in no time at all.